Lui Shou-Kwan (1919-1975) was a native of Guangdong province. His father ran a painting and calligraphy shop in Guangzhou, where he had many chances to view and learn about Chinese painting while growing up. The family moved to Hong Kong after 1949 and Lui worked for the Yaomati Ferry Company there for many years. 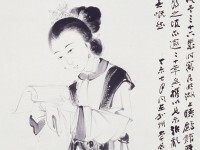 However, he still devoted much of his time to art and developed from a conventional guohua artist to an experimentalist. In the 1960s and 1970s Lui was a founding member of several art societies, such as Yuandao Art Society and Yi Art Society, which were seeking ways to develop Chinese art by adapting western ideas. 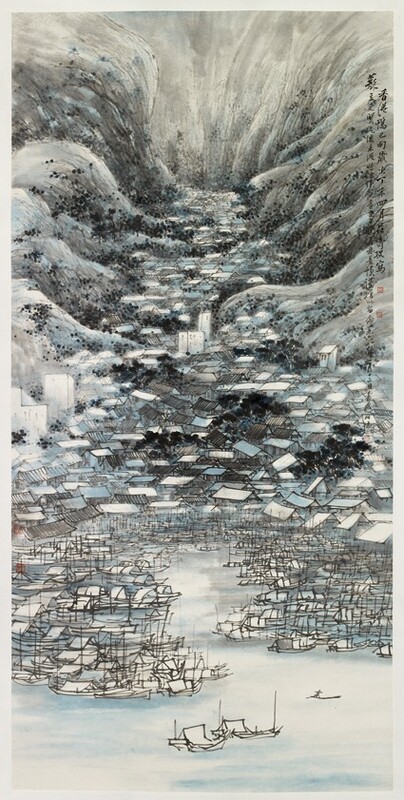 During this period, Lui and his many pupils contributed to revolutionizing guohua ink painting in Hong Kong. His later work became increasingly abstract and related to the Chinese philosophical idea of Zen. This painting gives a graphic impression of the floating village of Tanka people at Aberdeen Typhoon Shelter, Hong Kong, in the 1960s. In the Ming Dynasty (1368-1644), Aberdeen Harbour emerged as one of the most important fishing ports in Hong Kong and as the area of the Tanka people, who used to live on boats and fished for a living. In 1963, the total population of boat dwellers in Hong Kong was estimated at 150,000. However, the population of the Aberdeen Floating Village community has decreased in recent decades, due to rapid development of fisheries in nearby Guangdong Province and the increase in operating costs of the fishing industry in Hong Kong. Instead of living on boats permanently, the majority of the boat people now only fish during the day. The view depicted in this painting no longer exists.